Which biodiversity definition for biodiversity conservation? The variety of the forms of life has been a subject of philosophical reflection at least since Plato, who in the Statesman celebrated the diversity of the natural world as a mean to shed some light on the relationship between humans and other animals. The term “biodiversity”, however, was coined only in 1985, gaining immediate acceptance, and coming to stand for more than a mere contraction of “biological diversity”: if biological diversity is the target of awe and wonder, primarily aesthetic, biodiversity becomes instead something to be protected, loaded with ethical and political meanings. 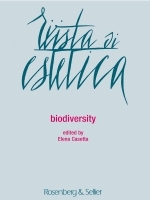 This issue of the “Rivista di estetica” addresses what might be called “the philosophy of biodiversity”, a reflection at the intersection of the philosophy of science, epistemology, aesthetics, ethics, and politics. Elena Casetta, Anouk Barberousse, Sophie Bary, Alessandro Minelli, Philippe Huneman, Patrick Blandin, Jorge Marques da Silva, Sue Spaid, Matteo Andreozzi.